All six episodes from the first series of the Channel 4 sitcom starring Simon Bird and Tamsin Greig, centred around the regular Friday night meal shared by eccentric Jewish family the Goodmans. 20-something brothers Adam (Bird) and Jonny (Tom Rosenthal) may have left home and carved out lives (of sorts) for themselves, but when they go back to their parents' home every Friday night they always seem to find themselves caught up in the ol..
Every episode from the first two series of the Channel 4 sitcom starring Simon Bird and Tamsin Greig, centred around the regular Friday night meal shared by eccentric Jewish family the Goodmans. 20-something brothers Adam (Bird) and Jonny (Tom Rosenthal) may have left home and carved out lives (of sorts) for themselves, but when they go back to their parents' home every Friday night they always seem to find themselves caught up in the o..
Tuck into five glorious helpings of award-winning madness with the Goodmans as they get together for a Friday night dinner of food, family and major-league bickering. Of course every family has its eccentricities, it’s just the Goodman family have made an art form of theirs. Friday Night Dinner is an original series about growing up but not growing away. It marries the groundbreaking with the familiar and, best of all, it’s really, real..
Each week twenty-something brothers Adam and Jonny go back to Mum and Dad’s house for Friday night dinner, and each week Mum and Dad get ready for an evening of domestic squabbling, food-related pranking and lashings of ‘crimble crumble’. In this series, Adam goes out with a girl who smells like Mum, Jonny gets a girlfriend who’s twice his age, Dad dries fish in the downstairs cupboard, Mum is forced out the house by a mouse, neighbour .. The award-winning, smash hit comedy is back for a third helping of family mayhem, as brothers Adam and Jonny go back to Mum and Dad’s house for an evening of food, fighting, and frozen foxes… In this series, Adam gains a new female admirer - a 9-year-old girl, Jonny gets the world’s worst tattoo, Mum practices being a counsellor on her horrified family, Dad paints a hideous portrait of Mum, Grandma goes back out with the terrifying Mr M.. The smash-hit comedy is back for a fourth delicious helping of six tasty new episodes, as brothers Adam and Jonny return to Mum and Dad's house for a night of roast chicken, crimble-crumble and a side-plate of mayhem. In this series, Jonny comes back from Las Vegas with a new wife, Adam is left stranded outside in only his pyjama top - and no pyjama bottoms, Dad invites a friend over who speaks with his eyes closed, Mum is forced to pre.. The Goodmans are back for a fifth helping of roast chicken and mayhem, as brothers Adam and Jonny come home for an evening of Mum’s home cooking, and a good old-fashioned food-fight. 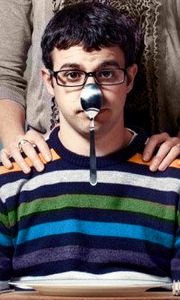 Mum organises her own, terrible surprise party, Dad becomes obsessed with his old, terrifying ventriloquist dummy, Jonny won’t stop prank-calling Adam, Adam attacks Jonny with a meatball, neighbour Jim goes on a date from beyond hell, Aunty Val hides Dad’..
All 18 episodes from the first three series of the Channel 4 sitcom starring Simon Bird and Tamsin Greig, centred around the regular Friday night meal shared by eccentric Jewish family the Goodmans. 20-something brothers Adam (Bird) and Jonny (Tom Rosenthal) may have left home and carved out lives (of sorts) for themselves, but when they go back to their parents' home every Friday night they always seem to find themselves caught up in t..